Essential fatty acids (EFAs) are compounds that cannot be made by the body but are required for many crucial biochemical processes. There are two groups of EFAs: omega-6 and omega-3. The relative levels of these two groups of EFAs are critical to the health and development of the brain and the body. If the level of omega-6 is much higher than the level of omega-3 in the diet, there can be negative effects on cognition, mood, and behaviour. The ideal ratio between these EFAs has been estimated at 2.3 omega-6 to 1 omega-3. Most North American diets provide too many omega-6 EFAs and not enough omega-3 EFAs, giving a ratio estimated at between 10-20 omega-6 to 1 omega-3. Grains, processed foods, meat, milk, eggs, and corn oil all contain omega-6 EFAs. Eggs (especially omega-3 eggs), canola oil, and walnuts contain omega-3 EFAs. However, the best sources of omega-3 EFAs come from fatty fish such as cod, tuna, halibut, mackerel, herring, trout, sardines, and salmon. Omega-3 EFAs can be added to a child’s diet with a fish oil supplement purchased over-the-counter or online at a grocery, drug, or health-food store. It can be taken one or more times every day. Children may find swallowing fish oil capsules difficult, but several flavored chewable or custard-like options are also available. Alternatively, adult-sized gel caps can be squeezed into a small child’s mouth or swallowed by an older child. 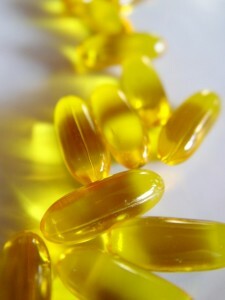 The recommended dosage of the omega-3 fatty acids EPA and DHA for all ages is at least 650 mg/day (total). Medical supervision is recommended for daily intakes above 3 grams. There has been no research on the optimal dose for children with autism and research on other disorders shows that the best dose of EFA depends on the disorder, but it seems to range from 1-2 grams per day. Research on using EFA supplementation to treat autism and related disorders have used doses of omega-3 EFAs at 540-2320 mg per day (0.5-2.3 grams/day). If you choose omega-3 EFAs as an alternative therapy, ask your child’s pediatrician what dose is appropriate for your child. The best source of omega-3 oils for vegan and vegetarian families is flaxseed oils and several types of algae, but the EFAs from these sources are not as useful for the body as those in fish oils. There are currently only a few studies of the effectiveness of EFA supplementation as a treatment for autism, and none of these have been well controlled. For example, most of the parents of eighteen children with autism who had been supplemented with fish oil (Eye-Q at 4-8 capsules/day giving 0.6-1.2 grams/day of EPA and DHA, or Kirunal at 5-10 capsules/day giving 1.2-2.3 grams/day of EPA and DHA) for six months described improvements in overall health, cognition, sleep patterns, social interactions and eye contact. Unfortunately, this was not a double-blind study, meaning it is possible that this is just a placebo effect. In another case report, a child diagnosed with autism who had been given 540 mg of the omega-3 fatty acid EPA per day over a four week period experienced a complete elimination of his previous anxiety about everyday events as reported by his parents and clinician. They also described an improvement in his overall quality of life. In a double-blind, controlled study, 117 children with dyspraxia, a motor disorder frequently associated with cognitive, behavioural and social challenges, received fish and evening primrose oil (a source of omega-6 fatty acids) during treatment. Significant improvements in reading, spelling, and behaviour were reported during the treatment period, and these improvements continued as long as the treatment was underway. Studies of EFA supplementation at doses between 540-2320 mg per day (0.5 – 2.3 grams per day) have not reported any significant side effects. As long as EFAs are less than 10% of the total dietary intake, they are considered safe. However, several scientists have noted that fish oil supplements can contain contaminants such as mercury, hormones, dioxins, and PCBs. Thus, when purchasing fish oil supplements, you should purchase those that are purified by molecular distillation and are described as pharmaceutical grade. Yehuda, S., et al. 1999. “Essential fatty acids are mediators of brain biochemistry and cognitive functions.” J Neurosci.Res 56(6):565-570. Ruxton, C.H., et al. 2004. “The health benefits of omega-3 polyunsaturated fatty acids: a review of the evidence.” J Hum.Nutr.Diet. 17(5):449-459. Young, G., and J. Conquer. 2005. “Omega-3 fatty acids and neuropsychiatric disorders.” Reprod.Nutr.Dev 45(1):1-28. Genuis, S.J.a.G.K.S. 2006. “Time for an oil check: the role of essential omega-3 fatty acids in maternal and pediatric health.” Journal of Perinatology 26:359-365. Kris-Etherton, P.M., et al. 2000. “Polyunsaturated fatty acids in the food chain in the United States.” Am J Clin Nutr. 71(1 Suppl):179S-188S. Richardson, A.J. 2006. “Omega-3 fatty acids in ADHD and related neurodevelopmental disorders.” Int.Rev.Psychiatry 18(2):155-172. Tsalamanio, E., et al. 2006. “Omega-3 Fatty Acids: Role in the Prevention and Treatment of Psychiatric Disorders.” Current Psychiatry Reviews 2(2):215-234. Johnson, S.M., and E. Hollander. 2003. “Evidence that eicosapentaenoic acid is effective in treating autism.” J Clin Psychiatry 64(7):848-849. Bell, J.G., et al. 2004. “Essential fatty acids and phospholipase A2 in autistic spectrum disorders.” Prostaglandins Leukot.Essent.Fatty Acids 71(4):201-204. Richardson, A.J., and P. Montgomery. 2005. “The Oxford-Durham study: a randomized, controlled trial of dietary supplementation with fatty acids in children with developmental coordination disorder.” Pediatrics 115(5):1360-1366. Richardson, A.J., and M.A. Ross. 2000. “Fatty acid metabolism in neurodevelopmental disorder: a new perspective on associations between attention-deficit/hyperactivity disorder, dyslexia, dyspraxia and the autistic spectrum.” Prostaglandins Leukot.Essent.Fatty Acids 63(1-2):1-9. Vancassel, S., et al. 2001. “Plasma fatty acid levels in autistic children.” Prostaglandins Leukot.Essent.Fatty Acids 65(1):1-7. Kitajka, K., et al. 2004. “Effects of dietary omega-3 polyunsaturated fatty acids on brain gene expression.” Proc.Natl.Acad.Sci U.S.A 101(30):10931-10936. Eritsland, J. 2000. “Safety considerations of polyunsaturated fatty acids.” Am J Clin Nutr. 71(1 Suppl):197S-201S.